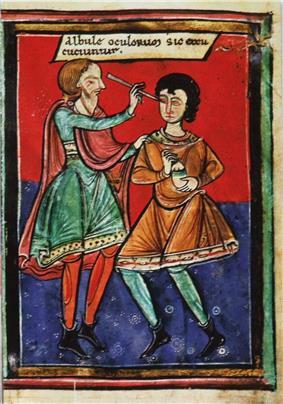 Since the eye is heavily supplied by nerves, anesthesia is essential. Local anesthesia is most commonly used. Topical anesthesia using lidocaine topical gel are often used for quick procedures. Since topical anesthesia requires cooperation from the patient, general anesthesia is often used for children, traumatic eye injuries, major orbitotomies and for apprehensive patients. The physician administering anesthesia monitors the patient's cardiovascular status. Sterile precautions are taken to prepare the area for surgery and lower the risk of infection. Sterile precautions include the use of antiseptics like povidone-iodine, sterile drapes, gowns and gloves. 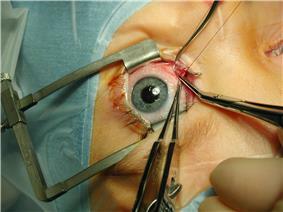 Mini Asymmetric Radial Keratotomy (M.A.R.K.) it consists of a series of microincisions, always made with a diamond knife, designed to cause a controlled cicatrisation of the cornea, which changes its thickness and shape. This procedure, if done properly, is able to correct the astigmatism and cure the first and second stage of the keratoconus, avoiding the need for a cornea transplant. Laser reversal of presbyopia (LRP),J.T. Lin, US Pat # 6,258,082 (2001). The Karmra inlay The Karmra inlay received the 2005 European CE mark. The 1.6 mm inlay is placed inside the cornea and has a small aperture that gives clearer vision at intermediate and near distances. TGA registration is expected sometime in 2011. Dexmedetomidine Versus Propofol in Vitreoretinal Surgery Alpha2 adrenergic receptor agonist have been used increasingly as a new armamentarium to provide sedative/hypnotic, analgesic, anxiolytic and sympatholytic effects in the perioperative settings. Dexmedetomidine, a selective and specific alpha2- adrenoceptor agonist has unique properties that makes it an almost ideal sedative drug for monitored anesthesia care in procedures under local or regional block. Unlike other drugs use for sedation, dexmedetomidine induces sedation that is similar to natural sleep (readily arousable) without causing respiratory depression. It attenuates the stress-induced sympathoadrenal response seen with laryngoscopy and intubation. It has anesthetic and opioid sparing effects, hence it may be a useful adjunct to general anesthesia and monitored anesthesia care in patients susceptible to narcotic induced respiratory depression. Another unique property of dexmedetomidine is that its sedative effect is reversible with Atipamezole. A previous study wherein dexmedetomidine has been used in procedures under local and regional block had shown that it provides effective sedation and better operating condition without significant respiratory depression. As a supplement to general anesthesia, it has been shown to provide stable hemodynamics. However, it is associated with some adverse events such as hypertension, hypotension and bradycardia, these commonly occur during bolus administration of the recommended dose of 1 ug/kg. Post-operatively it can cause nausea and vomiting. 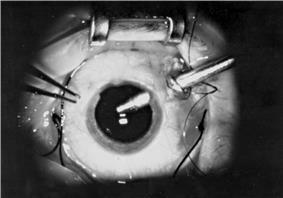 Vitreoretinal surgery requires either an injection of local anesthetic within the muscle cone (retrobulbar block),or into the periorbital space (peribulbar block). This can be done individually or in combination. 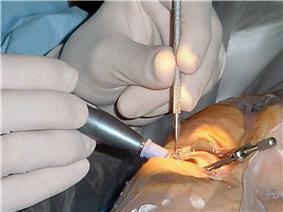 This surgery can also be done under a safer technique of retrobulbar block that is given using a sub-tenon's approach through a snip peritomy; a blunt cannula can be used with this technique mitigating the complications of retrobulbar hemorrhage or inadvertent injection into the optic nerve sheath or perforation of the globe using a sharp needle. 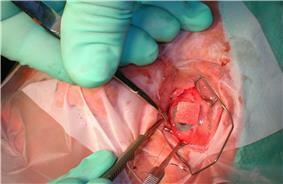 The anesthetic goal is to provide an immobile and uncongested operative field. Hemodynamic stability of the patient is also important since some patients that require this procedure are elderly with co-morbid conditions such as hypertension, diabetes mellitus and CAD. In our study we would like to investigate if Dexmedetomidine alone and in a reduced dose can prevent or reduce the incidence of adverse effects, provide hemodynamic and respiratory stability, provide adequate sedation with patient and surgeon satisfaction and compare it with Propofol.